Phildadelphia (CNN) - If there's one thing a politician must eat when he's in Philadelphia, it's a cheese steak. And true to form, President Obama made a quick stop to order four Monday at an unannounced stop at a farmer's market. Not exactly keeping with the first lady's healthy eating initiative but everyone needs some protein and fat. Obama ordered four Philly cheese steaks topped with sweet peppers and mushrooms, at the Reading Terminal Market which is a meat and produce market in downtown Philadelphia. After shaking hands with some of the crowd, he ordered the steaks and handed over $1. His personal aide, Reggie Love, had to step in to pay the rest of the tab to the vendor, according to pool reporters on the scene. At one point, a fruit vendor yelled "President Obama how about an apple? Something healthy too!" In his remarks later, he reported that he bought some apples so that "Michelle would feel like I'm eating healthy". But he also ordered a small mint chocolate chip ice cream cone to go as he headed on to give his campaign speech. He traveled to Philadelphia on Monday to give remarks for two fundraisers for Rep. Joe Sestak who is the Democrat running for Senate in the commonwealth of Pennsylvania. ....and I had Ramen Noodles for lunch. Well, Hell, when you walk in the shade of those Philadelphia cheesesteak trees, you just have to pick a couple of those fragrant fruits, just like you have to pick the pies off the pecan pie trees of Georgia. Always a great person and down to earth President. He has the wisdom of King Soloman and love and fearless of that of David. A great American and someone with the fear of God. His is always showing that he is a common person who was brought up right and willing to understand the issues and problems of the common people. He is going to church, lying and hobnobbing with people again, do I smell an election in the air. This is the phoniest, most inept, incompetent, lying union toady president we have ever had. Enjoyiing the end of this "summer of prosperity" I guess. The President hasn't a clue as to what things cost. Needs to have someone stand behind him taking care of expenses and also helping him govern. He wasn't ready to be President much less a Senator. He doesn't understand what "WE THE PEOPLE" really means. It's not a political staement! The people voted in a totally different person than the one now sitting in the oval office! Well, it won't work now. NO HOPE OF A SECOND TERM. 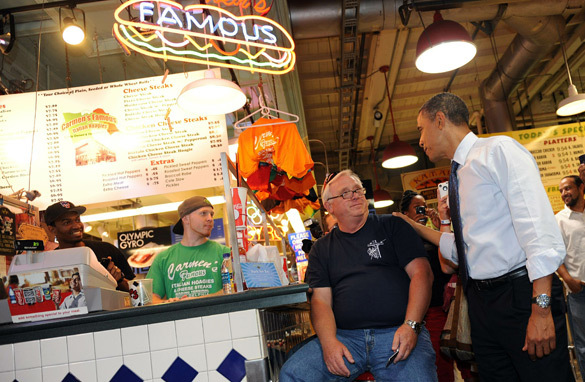 Go ahead, Mr. President–be charming with some more cheesesteak and healthy fruit. Your presidency has been scrapple. Mr. President, next time pick Pat's or Gino's. At some point we all have to take sides, even politicians. Love you Mr. President, and your town hall today was absolutely amazing. Keep doing what you're doing... God sees it, and has favor for you. Hope he liked our city, come back when you can stay longer. The jobs creation needs to start with the long neglected "rust belt" cities in the north. We have endured the loss (theft)of our jobs to the south, who has now lost those jobs offshore (how'd that make you feel, now you know how we felt), therefore we should be first in line for help. Besides they don't like you anyway.